With sunset views and the dazzling ocean right ahead of you, Villa Thansamaay is a dream come true tropical paradise offering the best possible holiday to travellers. Located on Laem Sor beach, Samui, close to many of the beaches and islands in the region, the villa caters to large gatherings, especially if you’re planning a beach wedding! Seven, fully-equipped bedrooms, including a kids’ bunk-bed room, a large swimming pool facing the ocean, and plenty of communal spaces for everyone, are only a few of the luxuries provided here at the villa. Villa Thansamaay features six bedrooms and a kiddie room for guests to have the comfortable and convenient holiday. 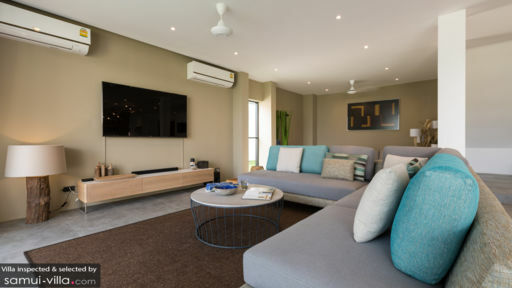 An oceanfront family suite is the first thing you see with its two bedrooms, en-suite bathrooms, and a kitchenette so that families with kids can have their own private area. A master bedroom is found with garden access, equipped with a king-sized bed and a small lounge area. Two other bedrooms are located on the ground floor with ocean views. Three bedrooms are located upstairs, including a kids’ room furnished with bunk beds for three. Each bedroom has king-sized beds, ample wardrobe space for your belongings, and excellently-appointed en-suite bathrooms! 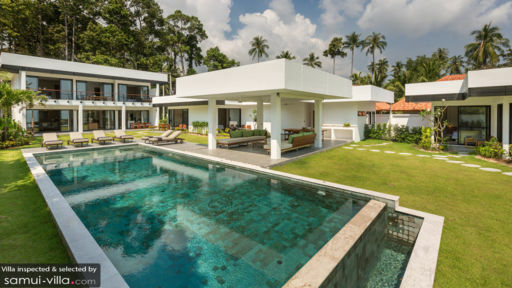 Not only is there a massive private swimming pool in the luscious gardens of Villa Thansamaay, guests have the advantage of hitting the beach directly from the villa grounds. There is so much to do including water games, sea kayaks that are available to guests, and of course, sunbathing on the patio or the pool deck, all of it in clear view of the ocean. Floral scents will invade your senses as you lie back and relax on the sunbeds, and while you enjoy a well-deserved nap, the tropical breeze will keep you company. Right beside the pool, facing the ocean, is a gazebo that houses a comfortably-furnished living room that is open-concept. With plush sofas and an alfresco dining area, this is the complete space for guests to chill with friends and family. A more modern and elegant living area is found indoors, furnished with a gorgeous, L-shaped sofa that faces a Smart TV equipped with Wi-Fi access and Netflix. You can definitely kick back and relax while watching your favourite movies and TV shows. The room is air-conditioned and leads directly to the gardens. Classy and sophisticated décor owing to caramel-coloured walls, selective artwork, and a few indoor plants truly brings out the opulence and comfort in the room. The space is shared with a dining area featuring a bench-style dining table equipped for plenty of guests. You can easily indulge in a feast with loved ones, digging into delicious Thai offerings. There is a swanky, all-white kitchen that is fully-equipped with state-of-the-art facilities and appliances for your use. Under the management of kind staff members, the villa remains spotless, maintained, and as good as the first day you checked-in. With CCTVs around the property, you can rest assured of your safety, and housekeeping ensures the proper upkeep of the villa. A Thai chef can be appointed as per your request if you wish to enjoy delicious local food. Sea Kayaks are there for your use so you can take them out when you choose. The villa is conveniently located on Laem Sor beach, close to many exciting beach clubs and restaurants in the area. There are, of course, a plethora of water activities you can indulge in or you can explore neighbouring islands like Koh Matsum and Koh Tan that can be reached on long-tail boats! Head to the fishing village of Thong Krut for an initiation into the Thai culinary scene.